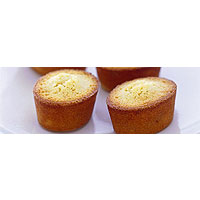 Like a lot of Australian cuisine, friands are not an indigenous invention. Originally from France, they are now stacked high on the counters of beachside cafés all over the country. The perfect snack with a cup of coffee after a morning spent in the surf, friands are closely related to financiers: small rectangular loaves said to resemble bars of gold. Some recipes call for the nuts to be toasted and the butter to be clarified, but the Australians usually skip this stage and the result is still wonderful. Using icing sugar, egg whites instead of whole eggs and very little flour makes them dreamily light, while the ground almonds keep them beautifully chewy and moist. Traditionally baked as small oval shapes in a specially designed friand pan, they also work perfectly when baked in a muffin tin. Preheat the oven to 200°C, gas mark 6 and place a flat baking sheet on the middle shelf of the oven. Place the butter in a small saucepan and heat gently until it has melted. Remove from the heat. Take a pastry brush and generously brush each of the holes in the tin until lightly coated with butter. This will crisp the edges and help you get the friands out of their tin once they are cooked. Allow the remaining butter to cool completely. Place the egg whites in a medium-sized mixing bowl and whisk lightly until really frothy. You don’t need to whip them into soft peaks as you would for meringues, just break them up a bit. Use the sieve to sift the flour and icing sugar over the top of the egg whites to break up any large clumps and incorporate some air. Scatter over the ground almonds and the lemon zest. Finally, pour in the melted butter. Fold all the ingredients into the egg whites until they are well blended and the mixture looks smooth, with no traces of butter. The batter can be stored in the refrigerator until you are ready to cook as it does not contain baking powder. Just give it a stir before using it. Take a kitchen spoon and fill all 12 holes of the muffin tin about three-quarters full with the mixture. Place the tin on the preheated baking sheet in the oven. Bake for 20–22 minutes until the friands have risen. They should be light golden around the edges. To ensure that they are cooked through, press the centres lightly. They should feel spongy, but will spring back into shape. Take the friands out of the oven and leave them to cool in their tins for about 5 minutes, so that they are cool enough to unmould. Run a sharp, pointy knife around the edges of the friands to loosen any stubborn edges before turning them out. To lift them out of the tin, place a clean tea towel on the kitchen worktop and turn the whole tin upside down giving them a sharp shake to release them. Alternatively, lift them out with the end of a blunt knife. Transfer to a wire rack to cool. Friands are best eaten on the day they are made, and are irresistible when warm. They will keep for a couple of days if covered and left at room temperature.